In 1912, Stockdale Ranch stretched along the Kern River west of Bakersfield. 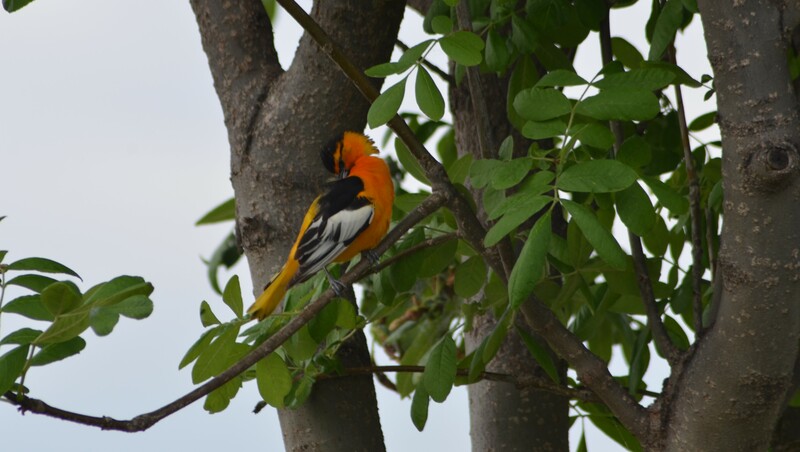 A walk along the wash could turn up the expected Yellow Warblers or Bullock’s Orioles amidst the riparian trees. The surrounding pasture land was home to Savannah Sparrows and Western Meadowlarks, with perhaps a Great Blue Heron stalking amidst the irrigation ditches. A visit to the ranch house would yield something a bit more exotic, though not exactly “wild” – a dozen Canada Geese raised on the grounds, along with a Whistling Swan and a “pink pelican” from Egypt. But there were no hordes of European Starlings whistling in the treetops. No Eurasian Collared-doves cooing from the chimneys. And certainly no Rose-ringed Parakeets chattering in bright green flocks amidst the clear blue summer sky. We arrived Friday afternoon at what will serve as basecamp for the first six days of field work (and by “we” I mean myself and Andrea, the undergraduate who will be assisting me this summer). For those who have never had the thrilling experience of driving through the Central Valley, the 4-hour stretch between Berkeley and Bakersfield can best be described as an endless horizon of flat brown scrub on one side, and on the other side row after row of the exact same nut tree orchard. To picture the area immediately adjacent to our current camp, just remove the part about the trees. In contrast, the campground here at Buena Vista is nothing short of an oasis. There is a large lake here (how it does not dry to dust, I have no idea), surrounded by a pleasant park of lawn and trees. People have flocked here in abundance. And so have the birds. While walking about the grounds our first evening we had Townsend’s Warblers and Lawrence’s Goldfinches picking through the pines, doves and finches and sparrows filling the air with song, and at one point, a flock of at least 250 Tricolored and Yellow-headed Blackbirds swirling overhead. Every night has been serenaded by the hoots of Great Horned Owls, and last evening one was perched within easy sight of camp (much to the noisy displeasure of the resident kingbirds). But this little shaded retreat isn’t what we came here for. Our first set of bird surveys retraced the visit made by Joseph Grinnell to Stockdale Ranch in 1912. 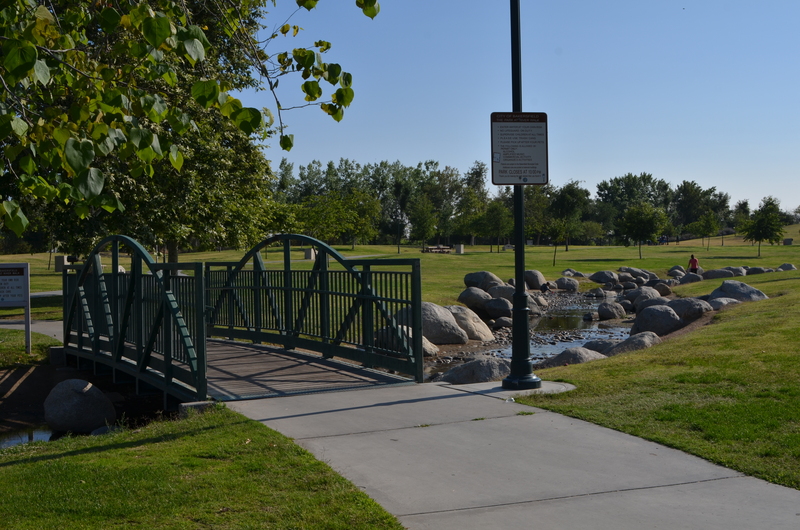 And while little remains of the original property (aside from an up and coming housing development that’s borrowed the name), a small portion of the land is now called River Front Park along the Kern River. The first leg of our survey route was a narrow strip of lush lawn shaded by numerous oaks and sycamores. The park runs between a row of perfectly-manicured suburban houses on one side, and the shrubby sands of the Kern River wash on the other. Despite the artificial nature of the miniature forest here, the trees were filled with mockingbirds, Western Scrub-jays, and Bullock’s Orioles. Even some warblers were flitting amidst the leaves. 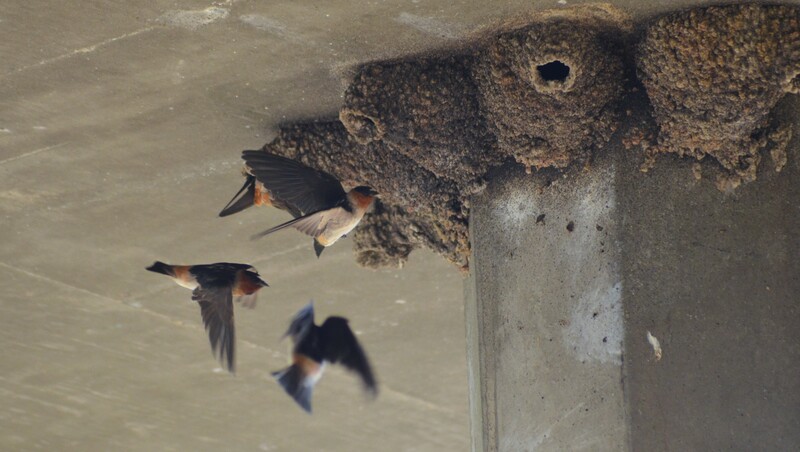 The path then passes beneath a highway, where the roaring of cars overhead competes with the chattering of dozens of swallows who have plastered their nests to the concrete pilings. A closer inspection of the shrubs just off the path even turned up a roadrunner. Climb up the other side of the highway, and the lawn opens up into a proper park, complete with two massive ponds and a luxurious manmade stream gushing through smooth round boulders. Bird life here has changed dramatically since the days when simple pastures and ranch yards once occupied the site. Savannah Sparrows have been replaced by House Sparrows squabbling over picnic crumbs, and the songs of the meadowlark are now the eclectic whistles and squeaks of Great-tailed Grackles and European Starlings. The stream at River Front Park. The final stretch of our route turned into the Kern River itself, a large expanse easily 150 yards wide and crisscrossed by numerous hiking trails. This riverbed is nothing like the gushing stream in the park just next door. The plants are scrubby willows and cottonwoods, and the ground is bone dry sand. In fact, a good half of our walk felt like a trek through the desert, complete with frequent stops to appreciate the tracks of snakes and rabbits etched into the grains beneath our feet. Despite being surrounded by the development of Bakersfield, the Kern River still offers a haven to some of its ancestral riparian scrub birds. California Quail were calling constantly and squabbling in the paths, California Thrashers were scurrying through the underbrush, and the sky was filled with swallows flitting about after flies. 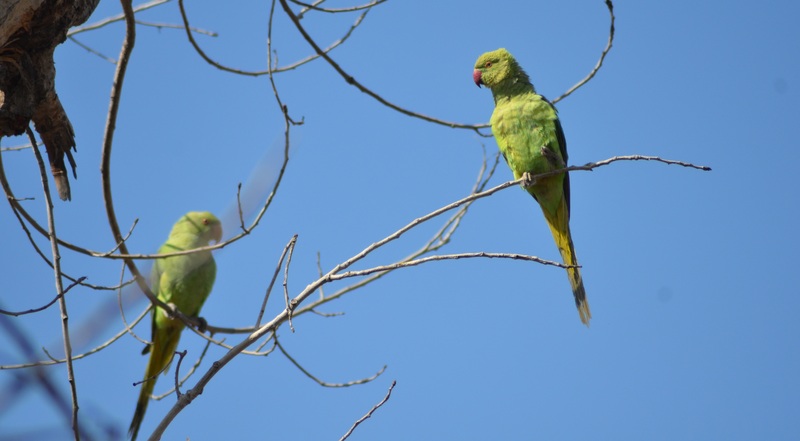 The remnant of native vegetation has become home to a new species as well – the Rose-ringed Parakeet. 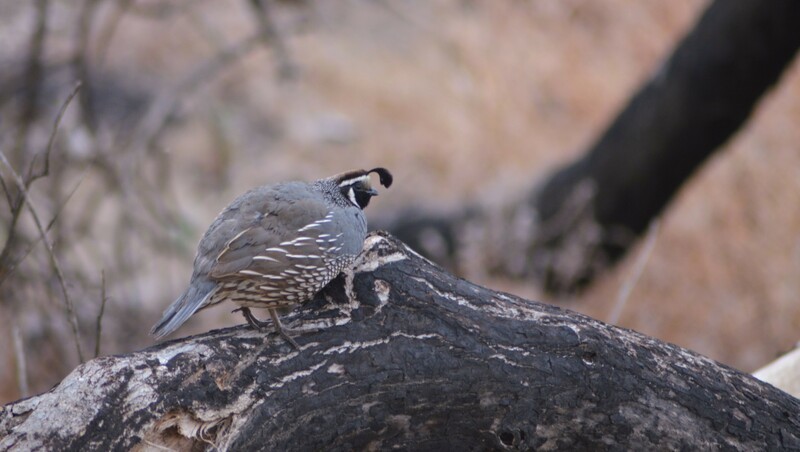 This Indian bird colonized Bakersfield in the 1970s, probably from escaped pets, and now this is one of the largest naturalized populations of the species in California. 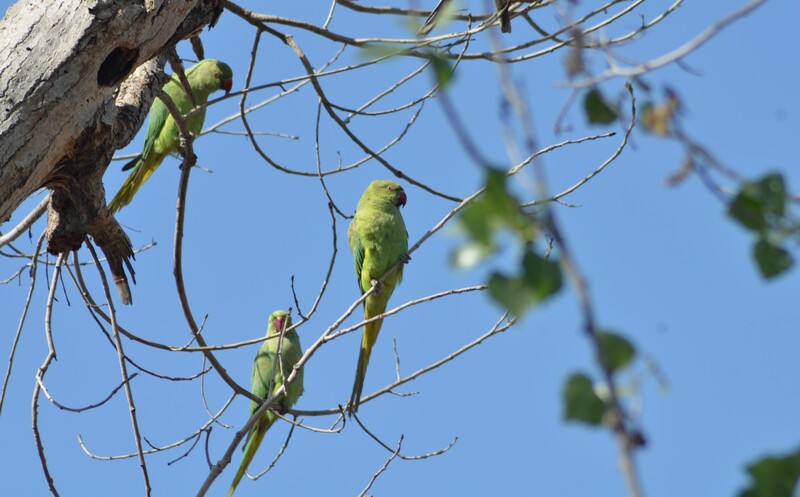 While we were treated to a couple brief flyovers of parakeets at other points along our route, it was not until we dove into the river wash that sightings became common, and we were able to find a group of at least seven birds perched together in the bare branches of a dead cottonwood tree. All in all, a successful first three days of surveys. The habitat here has changed dramatically, but the remaining vegetation still harbors a diverse community of birds. Our next sight, however, might be a very different story.